Linerunners Some day’s music this was, with it starting early afternoon and running right through to just short of midnight. As is everyday life, I had “stuff” to do during the day, but arrived just as the Linerunners kicked off their set. Toby Armitage from Linerunners Linerunners are fronted by Toby Armitage along with co-vocalist Lotty Milward-Brookes and they are quite a mix. Firstly, Linerunners have a sort of post-punk vibe about them, a touch of Joy Division and a smattering of Echo & the Bunnymen at times. So the vocal style won’t come as a surprise if you are familiar with that early 80s scene. Toby has a deep moody sound, and Lotty coasts with a smooth sound that contrasts nicely. They kicked off with ‘Lines Running Through’, quickly followed by ‘Children’ which kind of barks at you (in a good way), Nick Betts bass line adding that Peter Hook feel to their sound. Toby is quite a character, he doesn’t move from the mic stand, all the action comes from his head as he rolls it, shakes it and generally looks quite the mad, intense, dangerously intellectual musician. He’s actually none of those off stage, however I bought him a drink afterwards, just in case…….wait….he is intellectual. Am I safe? They played a favourite of mine, ‘Fat Sam’, a pretty laid back song with a nice layer of guitar from Steve Davies as the tune builds up and cools down and perfectly displays Toby’s grumpy vocals. You should check them out, they are one of those bands you feel you have to watch as they play, just don’t cross Toby! ! 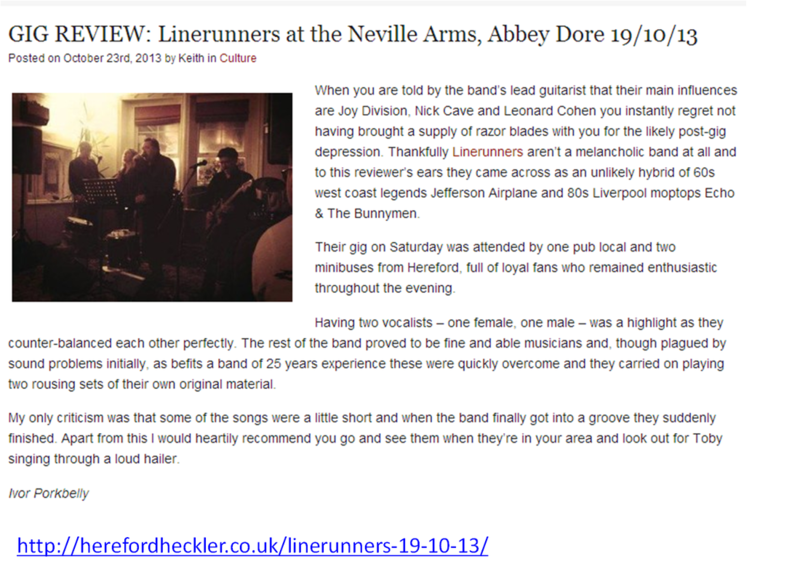 Within a few bars of their set at the Barrels in Hereford it becomes apparent that Linerunners are all about light and shade. Their light comes from Lotty Millward-Brookes and its shade (and sometimes darkness) is supplied in abundance by co-frontman Toby Armitage. The band’s frontline works like a high contrast photo – with Lotty’s highlights cranked up to the max but Toby’s shadows delivered as dark as possible. Lotty has a smooth and sweet voice, while Toby has a dark Doomsday growl that suggests something menacing is stirring. Together their combination brings both apocalyptic melodrama with the promise of sunshine and longer days sometime in the future. Nick Betts provides Peter Hook style bass lines (a very good thing), while guitarist Steve Davies is an energetic and inventive player. I particularly enjoyed his work on ‘Passerby’ which also showcases the rhythmic skills of drummer Phil Davies. Another highlight for me was the band’s mash-up of Joy Division’s New Dawn Fades and Love Don’t Live Here anymore by Rose Royce. Here Toby took the lead on the former and Lotty on the latter. It’s a combination that really shouldn’t work but it did - brilliantly. The band finished the Hereford Live event with No Secret featuring Lottie playing additional drums up front. It strongly suggests the importance of both Joy Division and Nick Cave as influences to the band. The only disappointment for me was that they did not play their stunningly sombre ‘Theme For A Journey’.